Argent Dark block with Graphite border. Marshalls Brown Natural Stone Paving. Excel Burnt Ochre Block Paving. Fairstone Natural Stone. Autumn Bronze. Is your Driveway looking tired and needing a fresh lease of life? Why not give us a call here at Paving Perfection based in Loanhead near Edinburgh Scotland to discuss your needs and requirements. Paving Perfections installs high quality Monoblock paving, natural stone paving, decorative paving slabs, and much more besides. From decorative chips, and turf to many other hard landscaping projects. Interested in seeing some of our professional work. 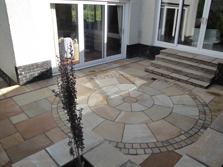 Why not take a look at our gallery, showing a small selection of our Driveways & Patios. More pictures will be uploaded regularly to our website. Paving Perfection are a family run business and take the utmost pride in the quality of our installations and customer service. 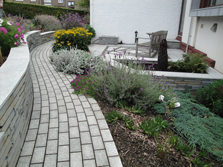 We have been trading since August 2005 and our Indoor Showroom is based in Loanhead (near Ikea) where you can view a large range of landscaping products for driveways, patios, paths, walls and steps as well as decking etc. Our showroom is open Mon to Sat from 11am to 4pm and is wheelchair accessible. Our teams have between 5 and 10 years experience in hard landscaping and have worked together for many years installing landscaping products as well as fencing, decking and turf etc. No matter how large or how small your project may be, it will be reassuring to know that our management carry out a daily site visit and speak to you personally on a daily basis to keep you informed of our progress throughout the duration of works. We have been a Marshalls Registered Contractor since 2006 and have gained a fantastic reputation over the years. We are very proud to have received awards in recognition of our workmanship and customer service. 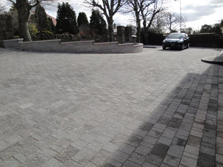 Installers of Monoblock paving, natural stone paving, decorative paving slabs, walling, decking, decorative chips, turf and all other hard landscaping projects undertaken.